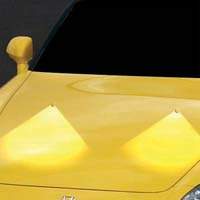 LED Windshield washers to give you Hood a Glow. LED Windshield Washers to set your Hood A-blaze in colored Light. Stock replacement LED Windshield washers that glow with intense LED light! Add the power of PlasmaGlow LED highlights to your hood with our LED Washer Nozzle Lights! These durable, black casing accent lights replace your existing washer nozzles, and add a stylish accent to your vehicle! All necessary instructions and hardware are included to ensure a smooth installation. LED Winshield washers are ready to go right out of the box and are backed up with the PlasmaGlow Liftime Warranty! The Windshield washers are Available in 6 brilliant colors! On Special! This week only. LED Windshield washers- Back to home Page.